WHAT ABOUT THE SPENT FUEL POOLS? In the aftermath of the terrorist attacks on the United States on September 11, 2001, concerns were raised about possible terrorist attack on a nuclear power plant, and in particular to its spent fuel pool (SFP). Nuclear power plants have well developed simulators for the reactor and balance of electric production parts of the plant. However, there are few simulators available for training in the response to fuel pool accidents. Entergy, working with Micro Simulation Technology is endeavoring to address this issue. The event of SFP draining or evaporation followed by zirconium fire has been previously analyzed in USNRC report NUREG –1738 titled “Technical Study of Spent Fuel Pool Accident Risk at Decommissioning Nuclear Power Plants”. This type of event could also happen at plants in operation. Yet to date there is no real-time trainer or analytical tool specifically developed for SFP. 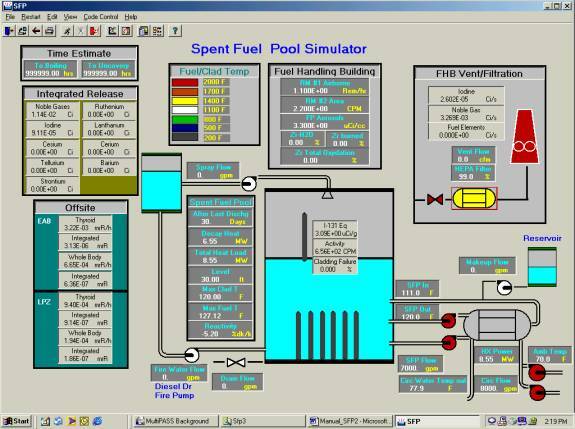 Entergy Nuclear Northeast has been working with Micro-Simulation Technology to develop PCTRAN/SPF/IP - a PC-based simulator to analyzed the thermal-hydraulics and radiological release of pool accidents for the Indian Point Nuclear Plant. The modeling is plant specific – with consideration of the fuel specifications, pool inventory of cycle burn-up, geometry, and cooling system of the nuclear station. Upon a loss of cooling or inventory event, the key time intervals to bulk boiling, fuel uncovering and clad fire can be projected. Also possible is a cask drop or boron dilution event that adds sufficient positive reactivity to reach critical levels. The simulator can create accelerated runs for practical exercises. Shown below is the graphics display of PCTRAN/SPF. There is a circulation cooling system with heat exchangers relieving the decay heat to the environment. Regular AC powered and emergency diesel-driven pumps are provided for coolant makeup. Simple point-and-click action on the PC monitor will disable or enable any of the components. When the fuel assemblies are exposed and heated up, their temperatures will be indicated in color. In addition to fission gases in the gap, damaged fuel aerosols such as alkali metals, tellurium, barium, cerium, lanthanides, etc. will be traced. Their contribution to building radiation monitors readings is calculated and displayed. Release paths through the vent and wall leakage are used to establish the site boundary doses. Using the tool for training or exercises will give the staff a quantitative feel and realistic appreciation of the event. Should an event occur in real life, the tool can make instant and precise projections of the time to pool boiling, fuel uncovery and dose release. It is practical for determination of protective actions such as notification, shielding and evacuation.